Linxworks Manager is a streamlined, web-based sales and marketing system that puts you in control, increases sales effectiveness, and boosts productivity. Linxworks Manager is the software solution that will empower your dealership to efficiently and effectively sell, market, and manage your new, used, and rental inventory. From searching up-to-the-minute inventory data in the field using Manager Mobile to automatic synchronization with your existing business system to automatic advertising on UsedIron, Manager can help you in real, solid, proven ways. 1. Web-based. No disc, no download, no software to install, no big upfront IT costs. 2. User-friendly. We've been making software for non-technical users for over a decade. 3. Automated. A number of Manager features, like its proprietary DTS™ system and patented PUF™ system, exist solely to make your life easier. Manager is a powerful system with all kinds of things going on 'under the hood', but we've dedicated ourselves to making it a simple and easy-to-understand system so that customers can put it to work instantly. Quick to learn. Nothing to install. You're up and running almost immediately after you become a Manager customer. Sure it's easy to use, but don't let that fool you. With a whole suite of marketing materials (including professionally-branded, automatically pre-built quotes (PDF) , brochures(PDF), and full-color inventory reports (PDF)). 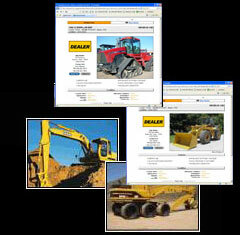 a host of productivity utilities solely designed to reduce overhead and eliminate headaches (like Manager Mobile, which allows you to take your inventory system with you wherever you are), and a built-in free advertising package (including an automatic feed of machines you choose to advertise on UsedIron.com, one of the busiest heavy equipment marketplaces on the web), Manager is an all-in-one inventory solution. This is just the start of what Linxworks Manager can do - for a full product tour, we'd love to hear from you. Contact us today and we can answer any questions you have about Manager. What can Linxworks Manager really do for your dealership? We'd be happy to discuss Linxworks Manager with you at your convenience. Please contact us today. Linxworks' Data Transformation System and your dealership. DTS is a proprietary system that integrates with your existing dealership system to take the effort out of data exchange. DTS is a system that 'speaks to' your existing dealership business system to import information on the machines in inventory without any need for re-entering, re-formatting, or manually updating data. The Linxworks DTS system translates your data into encrypted XML and then imports that data into your Manager system, where you can take advantage of the many sales, advertising, and productivity tools Manager offers. DTS can also be configured so units are automatically sent to the UsedIron.com marketplace, and your dealership website, for effortless, immediate advertising. If you have any questions about DTS or Linxworks Manager, please contact us today.